I am so thankful to YOU that I am still here for week 2 of the Project Run and Play competition!! My biggest take away from week one is overwhelming support from cheerleaders that came out of the woodwork with words of encouragement. Thank you! And, please keep voting for your favorite designs! This week's challenge was both exciting and terrifying. When I first read the cosplay prompt, I reached out to Wikipedia for an explanation. According to Wikipedia, "Cosplay, a contraction of the words costume and play, is a performance art in which participants called cosplayers wear costumes and fashion accessories to represent a specific character." Since the challenge is to create an outfit that is inspired by cosplay, my intention was to create something that could double as both costume wear and, worn separately, as everyday apparel. In the words of Yoda, "Do. Or do not. There is no try." The force is strong with this girl folks. My daughters have sipped the Star Wars Kool-Aid and joined the craze. We cannot walk down the macaroni and cheese aisle or the yogurt aisle at the grocery store without shouts of "Star Wars" at each product placement. As hard as I tried to brainstorm other characters, it always came back to this, so I present to you Rey in the Springtime. If you are unfamiliar with some of the latest characters from Star Wars: The Force Awakens, click here for our inspiration. My goal was to transform Rey's drab, oatmeal colored attire to something bright and playful. There is nothing unique about the scarves except the wonderful double gauze fabric. The butterfly prints are part of Patty Young's new line of double gauze for Riley Blake. 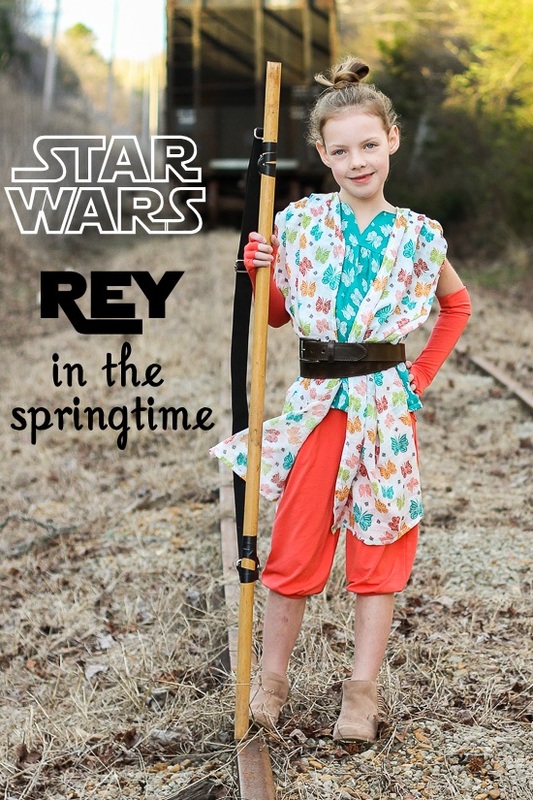 These prints really brought the springtime look for our Rey to life. The pants came about from a Japanese pattern for woven knickers. I slimmed them down quite a bit to accommodate knit fabrics, but still allowed enough drape to match Rey's pants. I swapped cuffs for elastic casings at the leg openings and revised the pockets and waistband. The extra-long cuffed gloves were drafted by tracing my daughter's arm and hand, then adding seam allowances. The top started with the Modkid Dakota pattern. I re-drafted the bodice to include a dropped shoulder and cap sleeve that mimic what I could see of Rey's top. I didn't want to use the bias bound sleeve of the pattern, so with my changes I was able to only bind the underarm portion of the sleeve. This top is wonderfully light and breezy in the double gauze fabrics. Of course, Rey's iconic hair had to be replicated! As you can see, omitting the accessories of the scarves, gloves, and weapon, results in a very comfortable, non-costumey outfit. Little sis wanted in on the action too, so BB-8 inspired her look. The skirt is a slightly modified Oliver + S Swingset Skirt. The applique details mimic the markings of the BB-8 droid. By lengthening the lining, binding the bottom edges, and providing drawstring holes in both layers, the skirt is fully reversible. The effect transforms the garment from playful to practical, or as my husband says, "From BB-8 to the dark-side." I recently went through testing for Hey June's upcoming junior's raglan top, so I took that pattern and graded it down to fit a 4 year old. The feminine gathers at the shoulder seams were my favorite added detail. As Obi Wan Kenobi says, "In my experience, there is no such thing as luck." Therefore, I encourage you to take the next step, use the force, and VOTE! I love how this whole look breathes springtime and happiness. This one immediately reads Rey but in a fabulous colorway. I really love the non-costume version -- the silhouette of the top and pants are fabulous. LOVE this! Just did a Rey costume and came very close to using the Dakota for the top. Thank you Kelly! The Dakota was perfect for this. I may add the cap sleeves to all of mine now! Such a great job!! I really like the whole thing. And it has inspired me to some spring looks. Gaining and providing inspiration is what I love about this online sewing community!! Such a wonderful look! Of course you know I love the skirt!! Those gloves...it's the look I spent so much time trying to achieve, but failed. Another amazing entry for PR&P! My kids are the same way - fortunately we have online shopping and can pick up our groceries so I don't have to shop with the kids and hear "I want the Star Wars cereal!" every time! haha! Your looks are great and so comfy and colorful! Love it! This is my first swingset, but there will be more! I love your color palette and prints--who knew that you could absolutely capture the essence of Rey with aqua and coral?! Nailed it! ces cosplayeurs sont vraiment magnifique, ils ont fait les costumes eux-même? j'ai juste acheté dans une boutique( cosplaysky.fr), la qualité est bien mais je sait pas si faire mon propre costume sera mieux.